President, Uganda Peoples Congress, U.P.C. 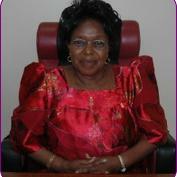 Widow of former Ugandan Prime Minister and President Dr. Apollo Milton Obote. who later served two presidential terms under the party's banner. although he had previously announced his intention to step down. elected head of, and presidential candidate for Uganda People's Congress. and she was reported to have garnered only 0.6% of the vote. president at the end of year 2009, citing age factor.